The illustration Jesus is making in this verse is on another topic, but my mind is particularly haggard this day. This verse came driving into it, when I heard of the tragedy at Sandy Hook Elementary School. The authorities will be deep into the investigations of how this could happen. "Liberals" will stir up questions about gun control. "Conservatives" will chant about how guns don't kill people, people kill people. I was living in Colorado when the Columbine school shooting happened. I saw a local news story of a Columbine teacher on the scene. He was well trained with guns, and happened to be in a position to stop it just as it started. Problem is, school policy blocked him from having a weapon. The story somehow never made the national news. Politically incorrect, I guess. The news tells us about how thousands of people are getting permits to carry concealed weapons, getting training, and buying guns. Where are these people when a nut decides to go shooting? Afraid to act? Some probably are. Don't actually carry? Many don't, even though they could. We have all seen this sign. 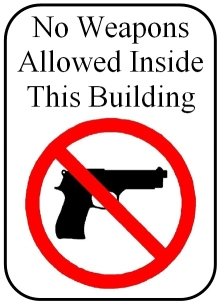 It appears on doors of shopping malls, stores, and schools all across the country. What does this sign say? To law-abiding citizens, it says, "Don't bring your gun in here." To a nut looking for what law enforcement calls a "soft target," it says, "Here's your kill zone." These guys may be nuts, but they're generally not stupid. For now, my prayers are with the people of Newtown Connecticut. May the Lord and His people comfort and lift up those who have suffered such loss.